Last week I showed you some of the cool things I got at a tag sale in our neighboring town. I had the best luck for finding vintage items in the one neighborhood I spent my morning, especially at this one sale. These vintage canisters are in great shape. I love looking through these! I found many fun things at this one sale, but I would have to say that the conversation I had with the homeowner was my favorite part. Her children were minding the items in the driveway so she and I could chat it up in the garage as I looked through her sale items and heard the history on many of them. She is a lifelong resident of our county and the type of sweet southern lady our county was once filled with. It was a true vintage experience in more ways than one. The stop around the corner had the cutest little pug dog. 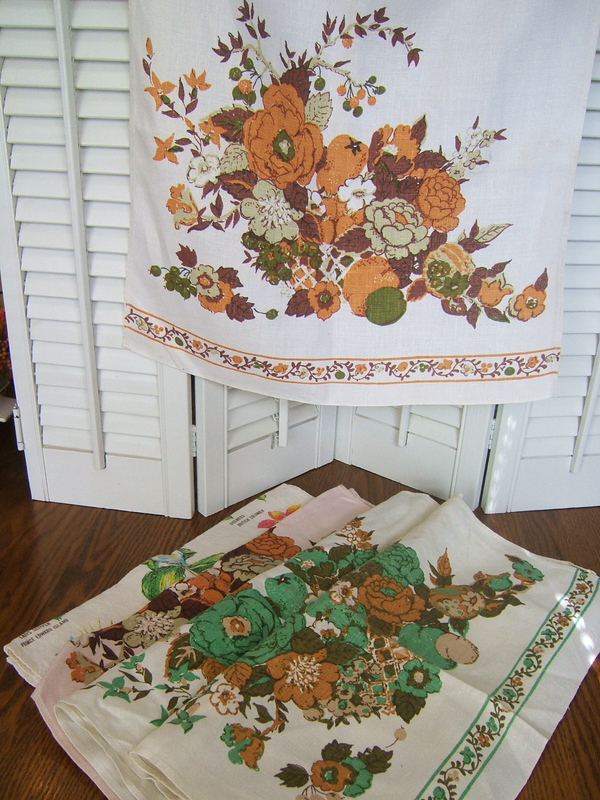 He was a major attraction at that sale where I found some lovely vintage printed linen table runners and a linen tea towel from 1967. My last stop for the morning was a big sale with an estate sale feel to it with lots of items belonging to the father of one of the sellers. 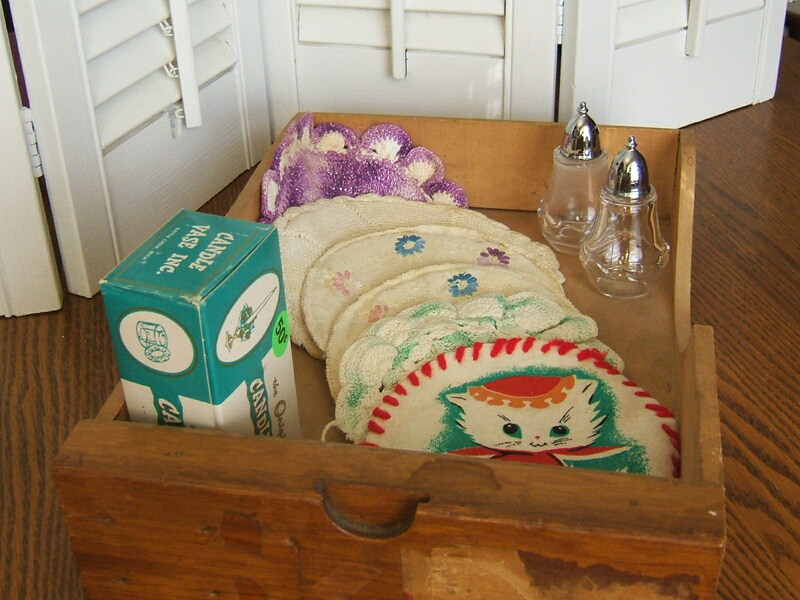 I came away with this interesting wooden box, vintage round hotpads, clear salt and pepper shakers, and rings to turn your candleholder into a flower holder, too. I also found this wooden shelf with a drawer, some Bordallo Pinheiro pieces and these white salt and pepper shakers which have a signature on them. Does anyone recognize this signature? Thanks for stopping by to see the rest of the Tag Sale items. If you haven’t seen part one, you can go here. I hope to join the parties at Flea Market Finds at Her Library Adventures, Apron Thrift Girl’s Thrift Share Monday, Knick of Time’s Knick of Time Tuesday, Nifty Thrifty Tuesdays at Coastal Charm, Thrifty Thursday at Tales from Bloggeritaville, Thrifty Things Friday at The Thrifty Groove, and The Penny Worthy Project at Hey, What’s for Dinner Mom? I love searching for dishes for tablescaping. That leads me to yard sales and thrift shops and fun, fun, fun. This entry was posted in Dishes, Garage Sales, Linens, Salt & Pepper Shakers, Thrifting, Uncategorized, Vintage, Yard Sales. Bookmark the permalink. What a haul you have here. 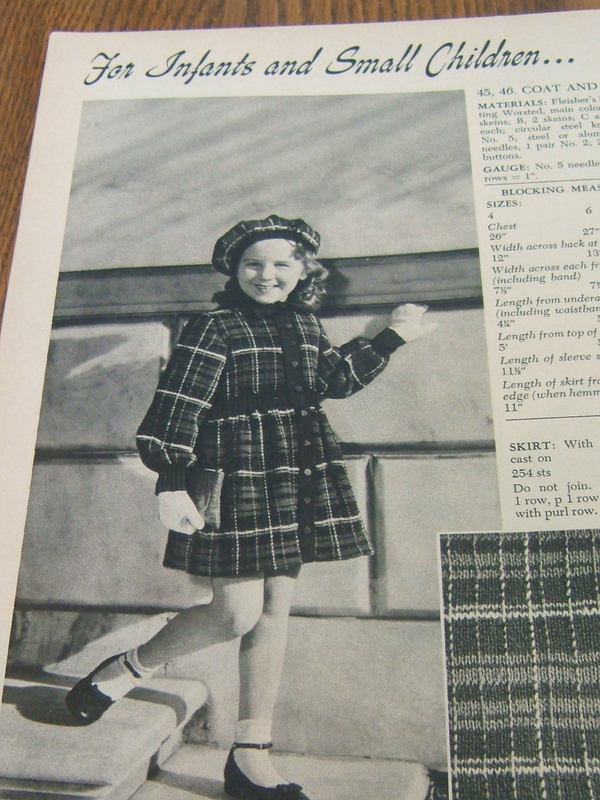 I really like those games and old catalogs; the catalogs are always so much fun to look through. 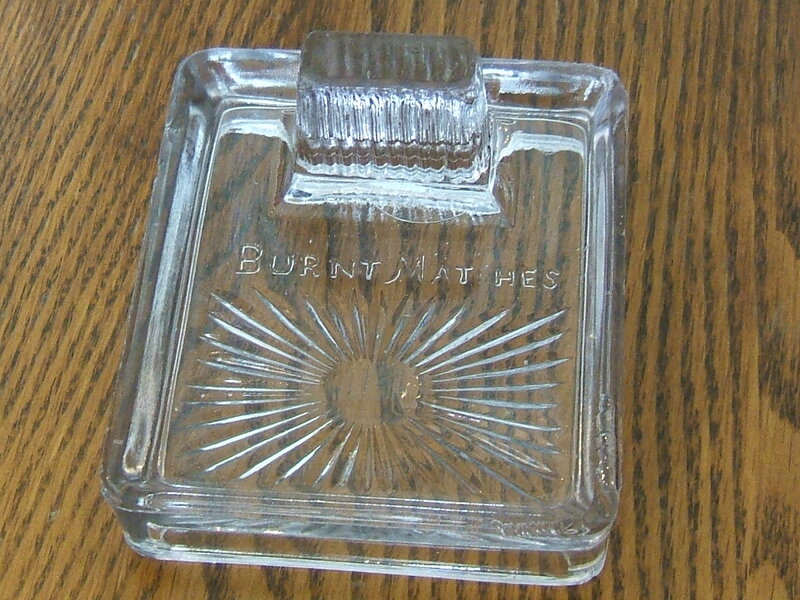 I haven’t seen one of those matchstick trays before. Sounds like you had a great time getting to know the people behind the treasures. Tammy – sounds like it was a wonderful day for you, I love getting a little bit of chit chat in with the people that are having the sale, they can tell you so much especially about items that you have no idea what they are. 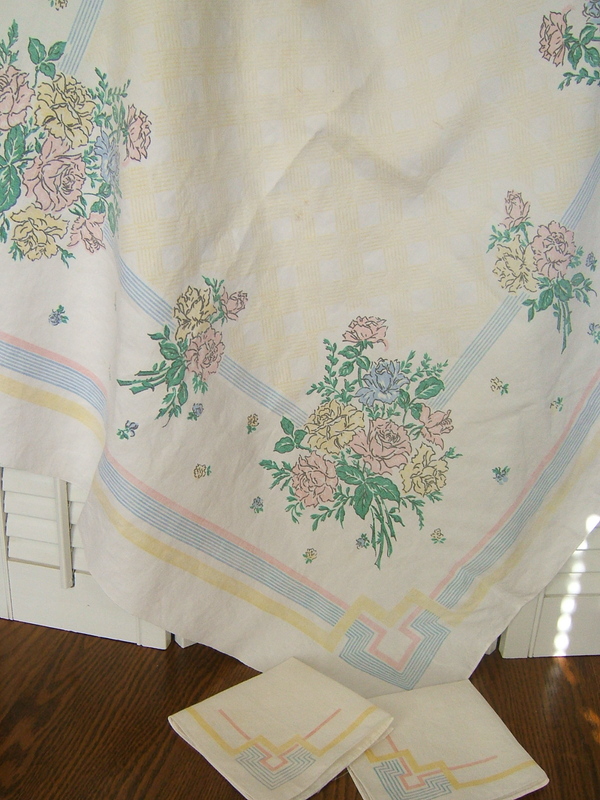 The linens are gorgeous and I am envious of the magazines (I haven’t found any lately). OH my, you found some amazing items. I love when the owner has time to chat and tell me the stories. Sounds like it was a fun adventure for you. Those canisters are so retro. Love the vintage games, always looking for those. And that pedestal bowl is so wonderful. Oh, what great finds. I would have enjoyed talking to that lady myself. That’s what hubby and I enjoyed about the old farm auctions we attended. There was always someone to explain the treasures to us. I’ve never seen anything like that match tray. How unique. My goodness!! Looks like you really hit the jackpot! What a marvelous collection! Those are great finds, Tammy! 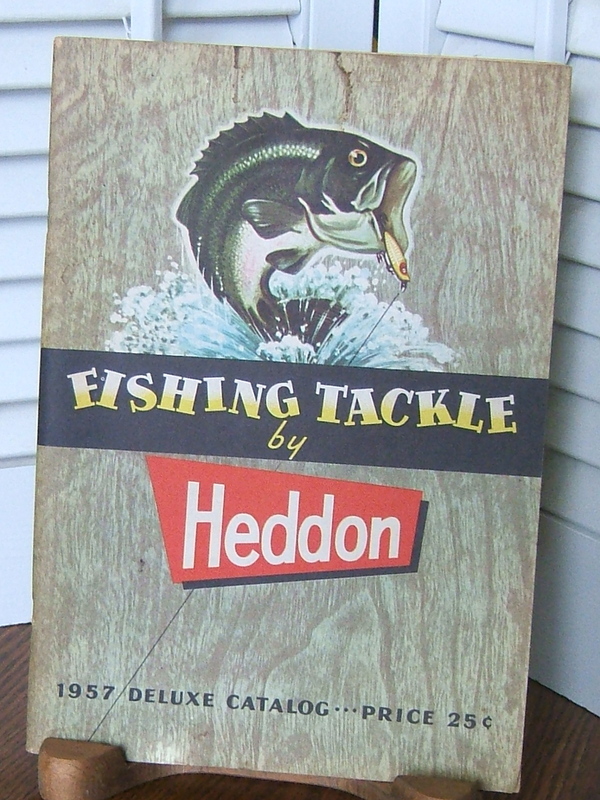 I love that vintage fishing catalog. . .would make a great gift for a fisherman (or woman) if you’ve got one in your family. Nice finds! 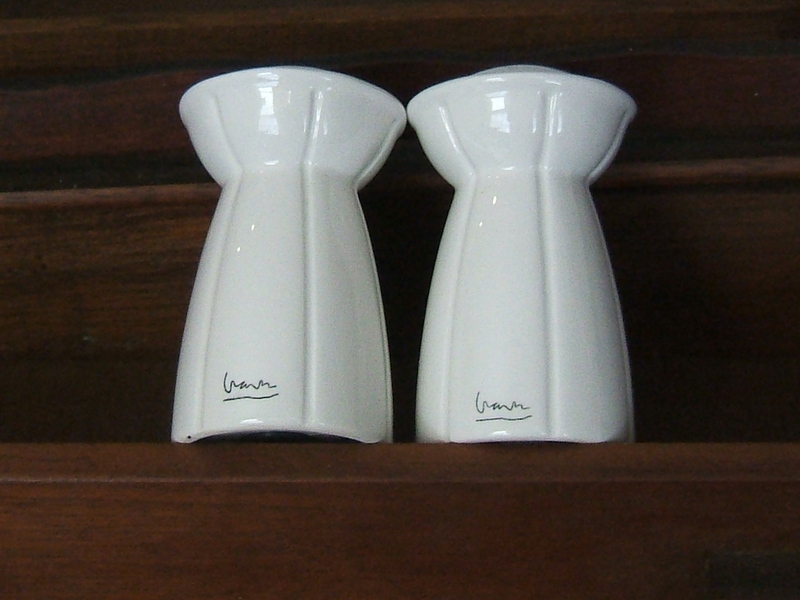 I’m pretty sure the signature on the white salt and pepper shakers is that of Michael Graves. I saw those very same canisters at Value Village last week!!! 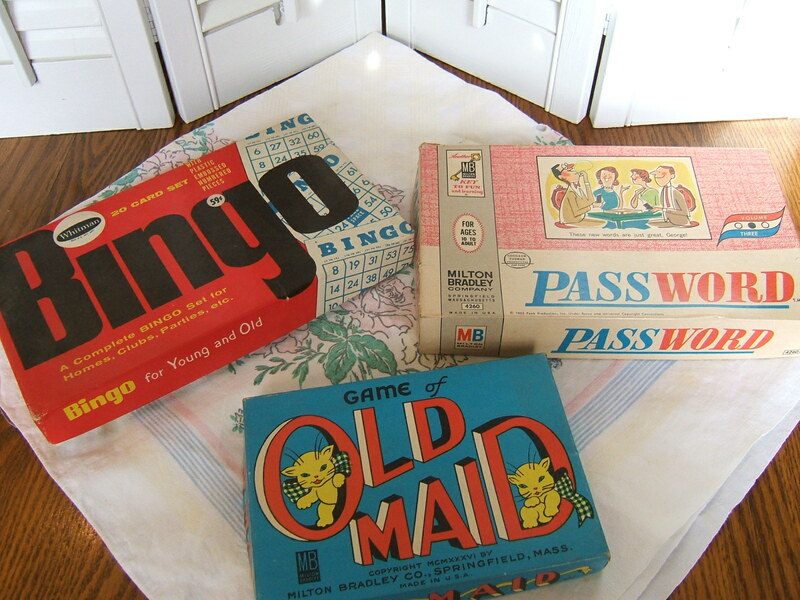 Love vintage games – I had Password and of course, who didn’t have bingo! O, Tammy, you did indeed find some wonderful things. Since I am olden, I have had several of these things before..and yes, the burnt match glass is really a treasure..love it. I’ve caught that same bug, I love dishes too. I just can’t help myself when it comes to some things. 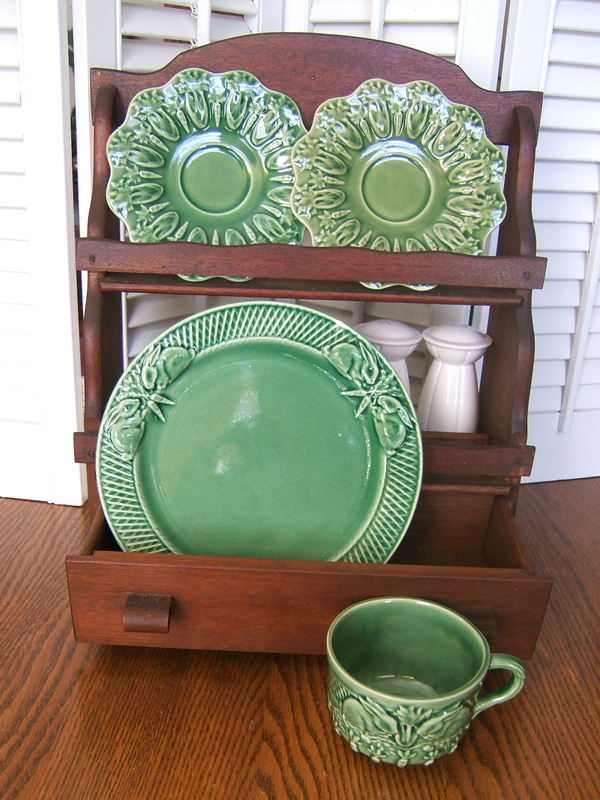 collecting dishes is one of them, Love the green. You found lots of great things. 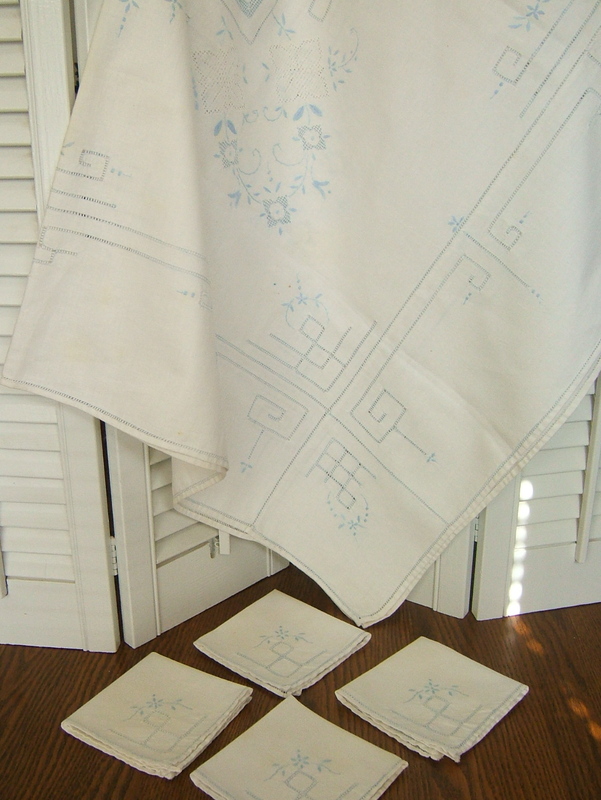 Love the tablecloths. you certainly found some great things and learned a little history too! 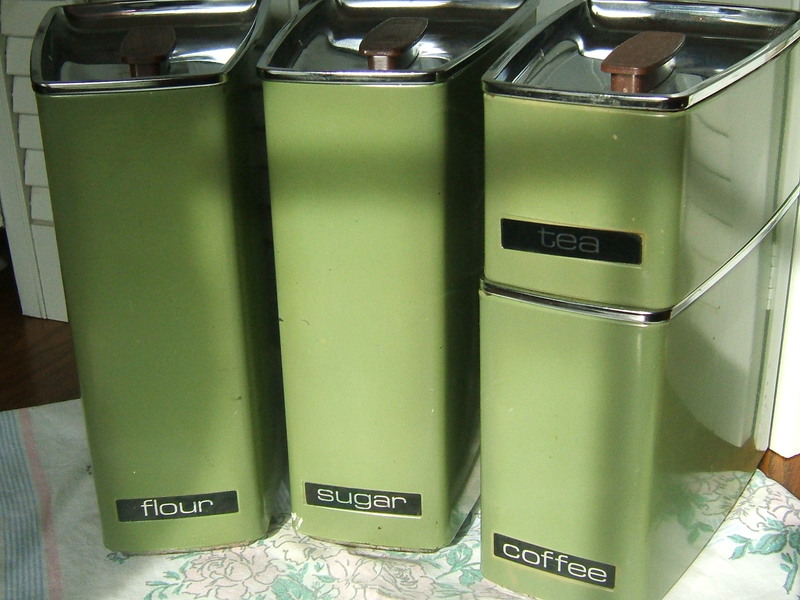 I have those same green cannisters, love them! 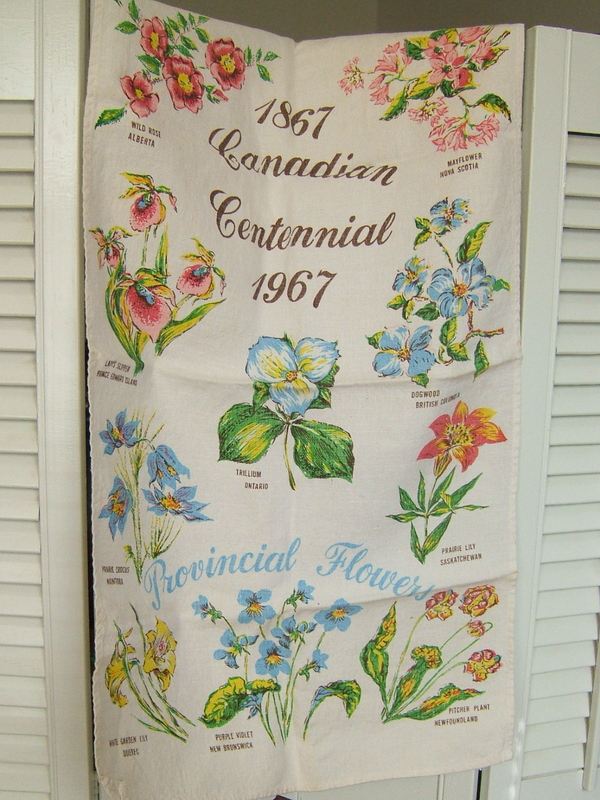 Those towels from the 60’s are another favorite, have to say I remember them growing up! Thanks for visiting! ohhh those green canisters would be so hard to pass up! did you ever find out the signature? WOW!! So many great things!! You really scored!! Love the green dishes!! All I can say is, “Wow!” Wonderful treasures. Tammy you really found some great items at these sales. 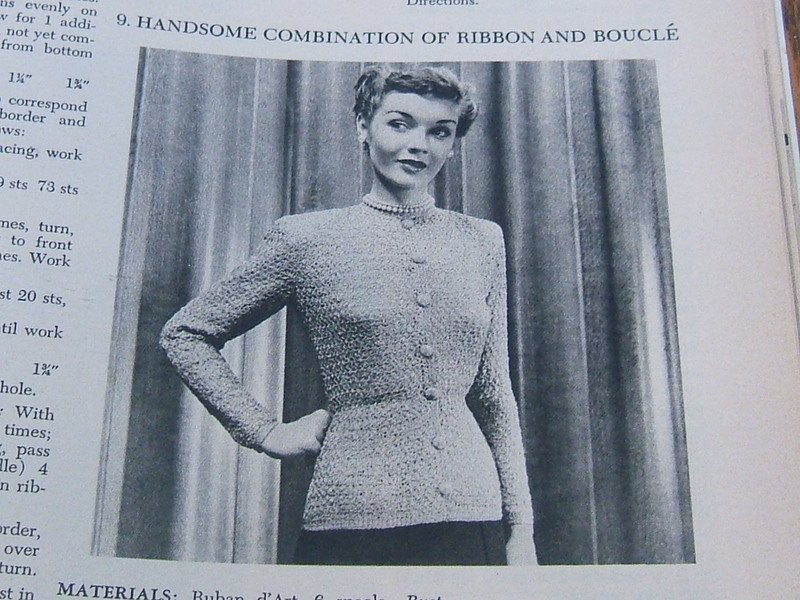 I love vintage so much! You found some great treasures…I especially like the wood compote…oh, the things I could do with that! Wow… great finds here. 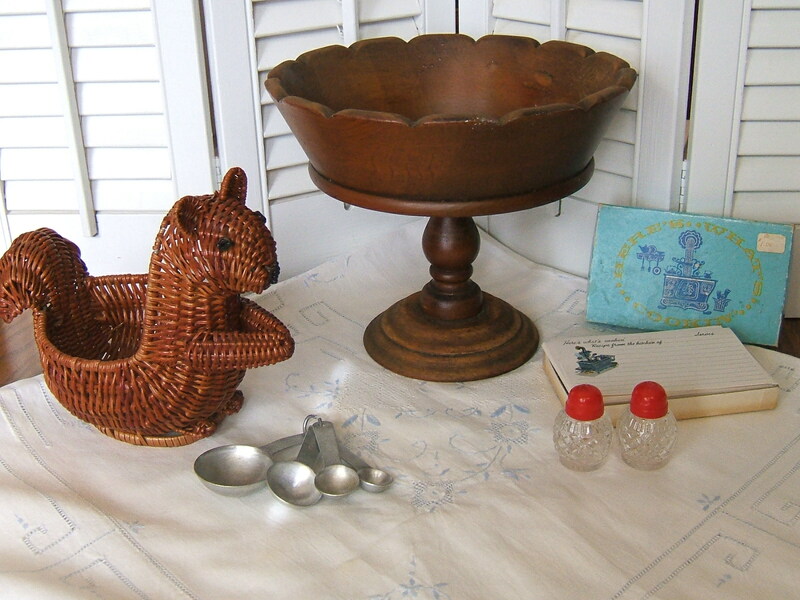 Love the vintage kitchen items, linens and dishes! Great finds Tammy! Love the little wood shelf with the drawer and the dishes are beautiful! Thank you for sharing them with us at TTF and have a happy November 1st! What wonderful finds, I am so jealous! I love the wooden scalloped pedestal bowl, it is so unique! Thank you for coming by my blog and commenting, you are so sweet to encourage me. I hope you come by again!